Residents and military officials testified about annexation reform Monday during a meeting of the House Defense and Veteran’s Affairs Committee. SAN ANTONIO — A special session of the Texas Legislature is still a month away, but state lawmakers are already setting the stage for the next debate over one of the session’s most contentious issues: annexation reform. 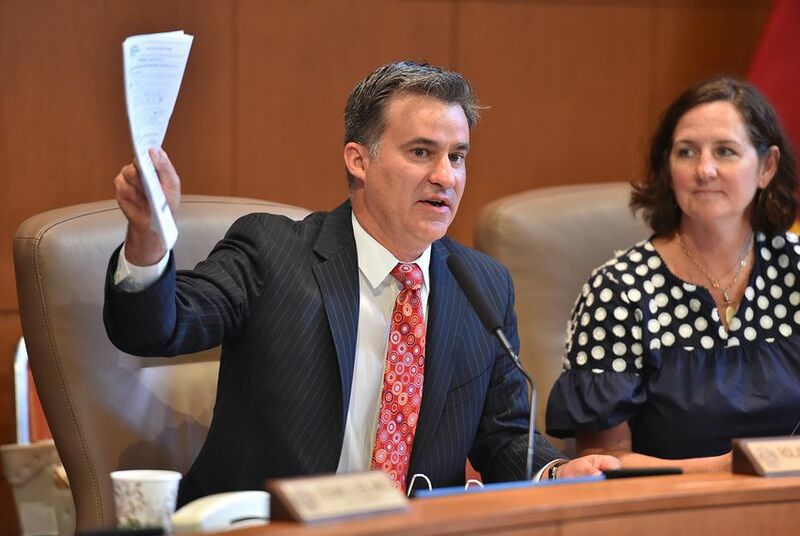 During a Monday meeting of the Texas House Defense and Veteran’s Affairs Committee in the San Antonio City Council chambers, Chairman Roland Gutierrez, D-San Antonio, said the main topic of discussion would be protecting military bases from closure. But the annexation reform discussion was just as prominent during the proceedings. More than 30 people testified in support of annexation reform, saying they want the right to vote when cities decide to annex their neighborhoods. While proponents say annexation is a handy tool for city planners, many have said they’re open to granting voting rights to individuals whose property might be annexed. But concerns over development encroaching on military bases have created a barrier for related legislation. Some residents testified Monday that annexation reform opponents could be using the military as an excuse to kill legislation they don't like. The annexation issue became inextricably entangled with the issue of military base closures this year when Sen. José Menéndez, D-San Antonio, killed annexation reform legislation with a filibuster in the final moments of regular session debate. At the time, he said the proposed bill, Senate Bill 715, did not offer adequate encroachment protection for military bases. 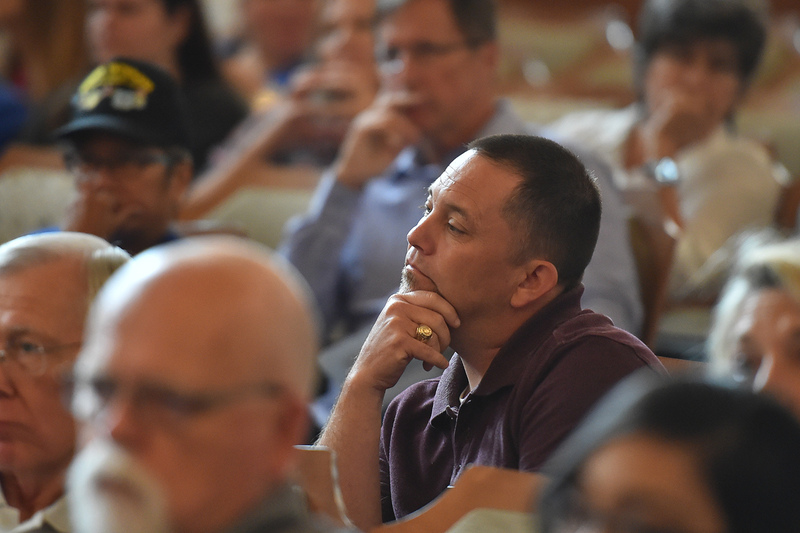 On the day San Antonio announced it had trademarked the name “Military City USA,” residents spoke after hours of testimony from military officials. Gutierrez read a letter from the commander of Joint Base San Antonio, Brigadier Gen. Heather Pringle, who said that the San Antonio military operations rely on local planning and land use. Annexation reform would make it more difficult for a city to expand its borders, and thus its regulatory powers. Joe Krier, an outgoing member of the San Antonio City Council, said that without those regulatory safeguards, cities could have trouble preventing development that could encroach on military facilities. Such development could put those bases in greater jeopardy of being shut down by the U.S. Department of Defense. In May, President Donald Trump called for a new round of base closures, stoking fears among state military officials that a Texas base — and the thousands of jobs that go with it — could get the axe. Clayton Hadick, a retired military veterinarian whose home faces annexation, contended that military bases are more likely to close because of a change in objective than because of restrictive encroachment. Mike Stewart, who testified and has long fought for annexation reform, said he could live with a bill that carves out protections for military bases even though there are "other ways to protect bases." Gutierrez said he hoped that in addition to informing the public about military needs, the meeting would “dispel some of the myths and rumors” that have clouded the annexation debate. For instance, Gutierrez said, many residents believe he does not support their right to vote on annexation. Gutierrez co-sponsored an SB 715 amendment that would have allowed residents who live near a military base to vote on proposed annexations as long as their neighborhoods could be subject to certain military-recommended regulations. Gutierrez's amendment was not included in the final version of SB 715, and he joined Menéndez in opposing that final version. Still, that was May. Citizens and lawmakers who opposed the final annexation reform bill in the regular session seemed to find a consensus by the time the Monday hearing was over. There can be a way to protect military bases and allow individuals to vote on whether their property can be annexed. "It seems like we're on the same page," Stewart said. San Antonio voted to annex his home. Now he's hoping the special session will give him a say.